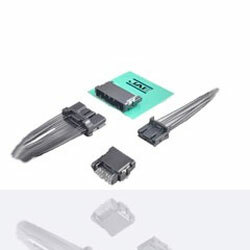 JAE has launched a new board-to-cable connector MX77A Series for automotive ECUs. The connector is now available from TTI Europe. Installation of ADAS sensors and communication equipment for Connected Cars advances and space limits demand smaller and thinner ECUs. Demands for small-sized and low-profile connectors are growing for use in BMS monitoring battery voltages. To meet these needs, the connector has been miniaturised while satisfying the strict requirements of in-vehicle applications. The connector is ultra-compact with a terminal size 0.4mm. The device is designed compatible with SMT to meet new mounting methods in the automotive market. The pin counts from 4 to 40 positions (4,8,12,16,20,24,32,40) covers various applications. The terminal area for signal is 1.8mm pitch, and terminal for power 2.1mm pitch. The operating Temperature Range is between -40C to + 85C, with a maximum Operating Temperature: 130C (ambient temperature + temperature rise due to conduction).